One of my childhood favourites! Light, fluffy, vanilla sponge cakes; smothered in a bittersweet, dark chocolate glaze and flaky, desiccated coconut - match made in heaven! This cake recipe requires a bit of patience and gentle hands. However, the sponge is very simple to make and super quick to whip up (you don't even have to grease or line the cake tins!). I recommend using two loose bottomed cake tins (or springform cake tins) if you can. If you only have access to regular cake tins, line the bottoms with baking paper to help with the removal of the sponges once baked. If you can't be bothered making your own jam; a good, tart store-bought variety works just as well. Likewise, since the meringue kisses are mainly decorative, omitting them will not detract from the cake's stature. For the sponge, preheat the oven to 180°C (160°C fan). As mentioned, if using loose bottomed cake tins, do not grease or line the tins. Place the eggs, caster sugar and vanilla bean paste in a large mixing bowl and beat on a high speed using an electric mixer (or free standing mixer) until really pale, fluffy and about double in volume (takes approximately 5 - 10 minutes). In a medium bowl, sieve together all the remaining dry ingredients. Once the egg and sugar mixture is ready, gently fold in the sieved dry ingredients using a large metal spoon or spatula. The mixture should be uniform with no lumps but still fairly light in texture. Divide the mixture between the two tins and bake for approximately 25 - 30 minutes (until a skewer inserted into the middle of each cake comes out clean). Once baked, remove the cakes from the oven and leave them to cool completely in the tins covered with a clean tea towel (the cakes usually dome in the oven but flatten again when cooling). Once completely cool, slide a sharp knife or spatula along the sides to release the sponges. Once the tin collars are removed, slide a sharp knife or spatula underneath to release the bottom portion of each tin. You can trim/even out the top of each sponge with a sharp knife if you wish. If you are preparing the meringue kisses, start by whisking the egg whites in a large, clean mixing bowl on a high speed (using electric beaters or a free standing mixer). Once they reach soft peaks, slow the mixer and start adding the caster sugar about one tablespoon at a time (allowing a little time in-between additions for the sugar to dissolve). Once the meringue is fairly stiff, add the icing sugar (sieved) and mix on a medium speed until the meringue is smooth and glossy. Using an 8mm round piping tip, pipe rows of meringue onto two trays lined with baking paper. Place in the oven at ±80°C until the meringue kisses are dry and crisp (approximately 3 hours). Once baked, allow the meringues to cool before storing them in an airtight container. To make the jam, start by placing a small plate in the fridge or freezer to cool (in order to test if the jam is set later). Place the raspberries, grated apple and vanilla paste in a small saucepan and place over a medium heat, stirring occasionally until the sugar dissolves. Bring the jam to the boil (104°C if you have a sugar thermometer). If you do not have a thermometer, test if the jam is set by removing the cold plate from the fridge or freeze then placing a small amount of the jam on the plate. Allow it to cool for a couple of seconds then drag your finger though it - if the jam seems firm and the surface wrinkles a bit, the jam is ready. If still very runny, cook the jam for a few minutes longer. When ready, pour the jam in a clean jar to cool. To prepare the raspberry and chia seed compote, place the ingredients (except the chia seeds) in a small saucepan over a medium heat until the sugar has dissolved. Add the chia seeds and stir through. Leave to cool. For the chocolate glaze, place the water and sugar in a medium saucepan set over a medium heat and whisk every now and then until the sugar has dissolved. Bring the mixture to a boil then remove the saucepan from the heat. Add the chocolate (broken/chopped into medium pieces), cacao (sieved) and cream and whisk until smooth (you can pass the mixture through a sieve if you want to ensure there are no lumps). To make the mascarpone Chantilly cream, place all the ingredients in a large mixing bowl and whisk together on a high speed until soft peaks (be careful not to overbeat). Place a small amount of chocolate glaze on a plate/dish and place the first sponge on top. Pour some glaze over and using a spoon, coat the sides of the cake. Transfer the chocolate coated sponge (an egg lifter works well) to another plate/dish containing desiccated coconut and coat the bottom, sides and top with coconut. Place the first coated sponge on a serving board or plate. Spread a thin layer of cream on top then pipe a cream border. Spoon a good dollop of cooled jam in the middle. Repeat the chocolate glaze and coconut covering for the second sponge then gently place it on top. Decorate the top of the cake with the remaining cream. 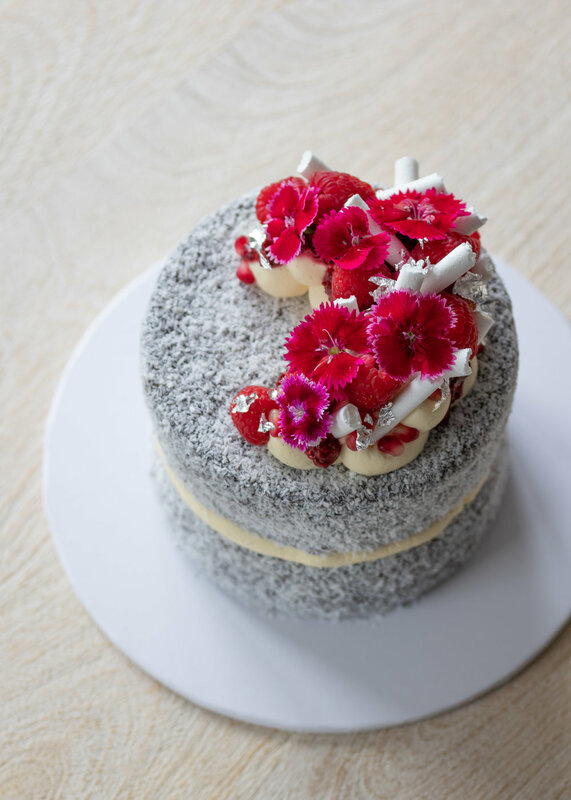 Just before serving, spoon over the compote and decorate the cake with the meringue kisses (breaking them into little sticks), fresh or freeze-dried raspberries and edible flower petals (I have used blue cornflower petals).